Ideal for breakaway connections, the Series 804 QDC connector features a stainless steel spring in the receptacle and a detent on the plug body. Used for headsets, radios, weapons and other applications, the QDC Mighty Mouse meets immersion requirements and provides excellent durability. The gold-plated spring provides low shell-to shell resistance for excellent EMI shielding. A fluorosilicone o-ring provides a watertight seal when mated. Cable plugs are available with an integral shield termination platform for use with Band-Master™ ATS microbands sold separately, or with accessory threads for backshell attachment. 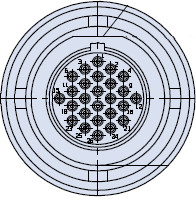 Contacts are crimp-type, and are packaged with the connector. These connectors feature an integrated backshell equipped with a removable rear cover and gasket, providing an easy path to installing the supplied crimp contacts. These panel mount plugs offer reduced profiles inside the box compared to panel mount receptacles. Connector bodies are sealed with epoxy to assure a water-tight open face seal. Choose in-line or jam nut versions for panel mounting. Crimp receptacles are available with an integral shield termination platform or with accessory threads for backshell attachment. Contacts are crimp-type, and are packaged with the connector. These panel mount connectors feature gold plated, factory-installed contacts. Connector bodies are sealed with epoxy to assure a water-tight open face seal. Need a miniaturized hermetic for a sealed box or instrument? These stainless steel, glass-sealed connectors are available with solder cup or PC tail contacts. 100% tested to meet 1 X 10-7 cc/sec helium leakage. Open face pressure rating 1000 PSI. Jam Nut mount, shell sizes 5 to 15. This connector mates with all push/pull plug connectors with the same polarization and opposite contact genders. Copper alloy goldplated contacts, pin to pin, pin to plug or plug to plug. Mighty Mouse Series 804 USB 3.0 flash drive featuring a push/pull 804 series ruggedized interface and available in 8GB, 16GB, 32GB, or 64GB storage capacities. The New Mighty Mouse Series 824 Locking Push -Pull connectors provides superior sealing, excellent EMI protection, low-profile ergonomic mating and demating, and easy crimp contact termination. Finally mil-spec performance in a push-pull shell. Mates and locks with the 824-001 plug. Available as in–line, jam nut rear panel mount and front panel mount. These plugs snap securely into receptacle housings and release with a simple pull. A single master key provides fast mating in low-light situations, or specify three keys for more polarizing options.